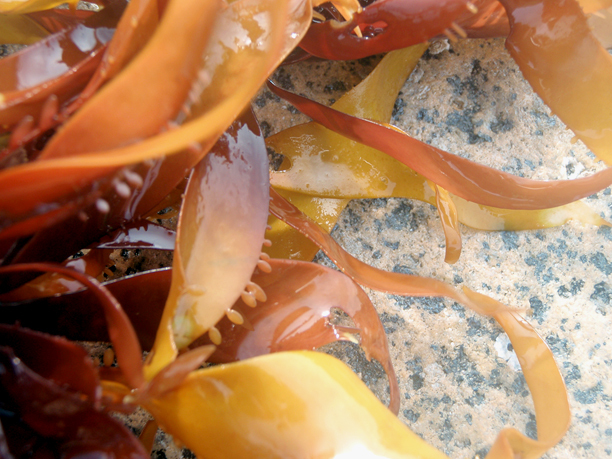 Narrow iodine seaweed photographed by Elizabeth Sargeant (bottom left) and Katy Fulton. The yellow tinge is often prominent in summer, when the alga is prone to a deficiency in nitrogen as nitrates in the surrounding surface water are in short supply. This red alga is highly variable in both colour and morphology. It ranges from red to red-brown to reddish-purple and is often tinged with yellow, especially during the summer. The body of the alga (the thallus), which is supported by a small disc-shaped holdfast, is composed of irregularly forked, flattened branches that form a cluster of elongated, tapered, and often curling blades. The edges of the branching blades are lined with small projections. 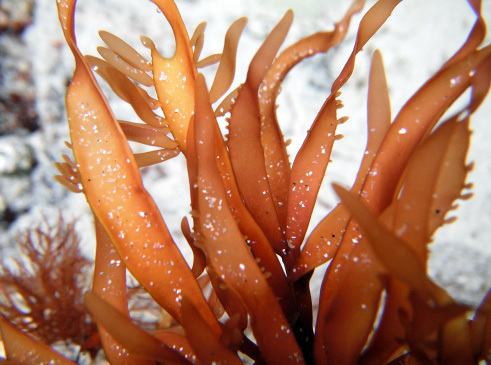 Narrow iodine seaweed grows 20-80 cm in length. The colour, size, and degree of branching vary with habitat. 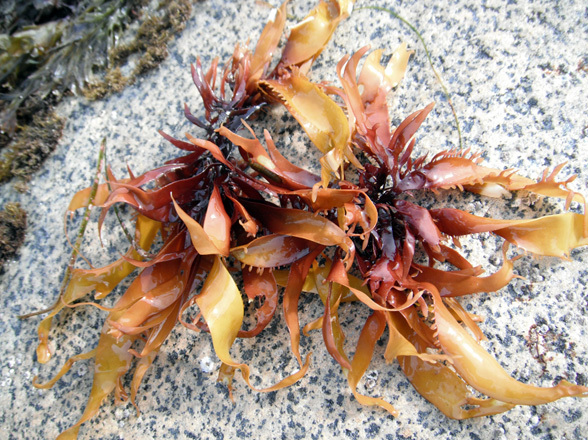 Narrow iodine seaweed can be found growing on rocks and in tidepools in the intertidal and subtidal; where it occurs in intertidal and subtidal habitats has a large impact on its morphology. Its range extends from southern Alaska to Baja California, Mexico. A nitrogen deficiency causes the yellow tinge that may be observed in this species; it is more prevalent in summer as nitrates in the surrounding surface water are in short supply. Both narrow iodine seaweed and bleachweed species — such P. sterbergii — smell of bleach when crushed. Chiu, A. (2003). Prionitis lanceolata. Marine Botany. Monterey Bay Aquarium Research Institute. Accessed 23/01/2015. O'Clair, R. and Lindstrom, S. Grateloupia americana Kawaguchi et Wang. In Klinkenberg, Brian. (Ed.). E-Flora BC: Electronic Atlas of the Plants of British Columbia. Lab for Advanced Spatial Analysis, Department of Geography, University of British Columbia, Vancouver. Accessed 23/01/2015.